Right after the 2010 earthquake, KIRF helped supply food staples to a remote village in Haiti called Oranges de Bainet. Since that relief trip, I have been in contact with people from Oranges. They have told me that a non-profit had built them a new school, but it was not finished. And, although they had a partially competed school, there were no school supplies to use to teach the students. Further, as a mediator and conflict resolution professional, I have often wondered if Haiti needed any conflict resolution assistance or training because of all the tragedy and possible civil unrest from the tragic earthquake. It is for those reasons we returned to Haiti earlier this month. With KIRF volunteers Patrick Rae (a member of the KIRF board), and Dr. Thomas Fiutak (whom I have worked with for a number of years at the United Nations Conferences on Climate Change regarding conflict resolution and mediation) we returned to Port-Au-Prince on July 16, 2012. The first thing I noticed that was different from our trip in 2010 was the absence most of rubble on the streets. And, that many of the tent camps we saw during our last trip were gone. The tent camps near the airport are still there, but many of the vacant lots and parks around Port-Au-Prince no longer have earthquake-homeless living in them. I also noticed that just outside of town, to the North, where many people fled and had constructed simple temporary living shelters on the dry hills after the earthquake, the government was building a reservoir to supply that new community with water. 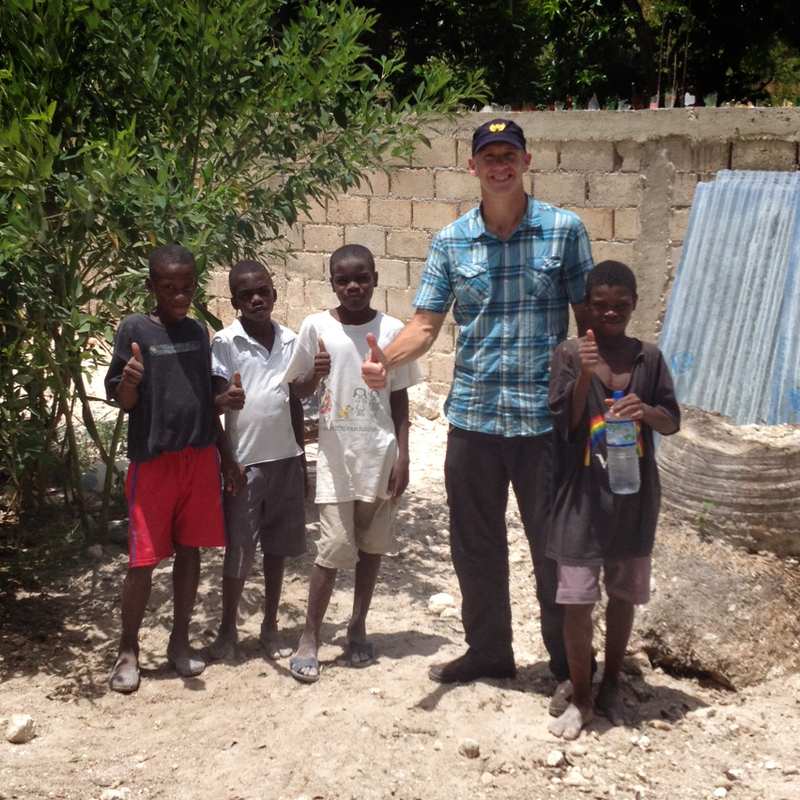 I talked to many people while in Haiti about the current state of affairs. As with any set of interviews on a subject, there were a variety of opinions on what needs to change in order to get the economy going stronger. But unanimously, each Haitians I spoke with wanted me to let the world know that Haiti is recovering, that the people of Haiti do have hope, that there is a good labor force in Haiti that wants to work, and Haiti is ripe for investment to start new businesses with it's new government and a sense of stability. Inside a classroom at the new school in Oranges de Bainet, Haiti. Once again, we experienced a lot of generosity and a willingness on behalf of the Haitians to assist us in helping their fellow citizens. After arriving in the late afternoon, on Monday the 16th, we left the next morning at 4:30 a.m. for the long drive to Oranges, via the road to Jacmel. Several local people volunteered their time to assist us with this project–of which we are very grateful. As one drives over the mountains to reach Jacmel, we took a left off of the paved road for a dirt road that went to Bainet. A two wheel drive vehicle would be hard pressed to travel this very rough and rocky dirt road. After several hours of winding through the mountains, with beautiful vistas, and street markets full of people selling all manner of produce and other foods, we finally arrived in Bainet. It took about 2 minutes to pass through Bainet when our dirt "road" dropped down into the bed of the Oranges River. That is where our four wheel drive was absolutely essential. We drove up along the Oranges River for hours, crossing the river bed at least 15 times, with water rushing up past the bottom of the vehicle doors. Then, finally, we were there: Oranges de Bainet. The town was a small community of houses, with a church and partially constructed school. We were met at the school by Father Maxis who has worked in this community for the last three years. The priest explained to me why education was so important for the children of the village. Not only does it educate the children for better jobs and a better future, but it gives them a sense of pride and will benefit the community. Hopefully, when children get an education and go on to college, they will return to the community to work and share ideas on how to make it a better place for all to live. Education also helps reduce violence in the community the priest said. 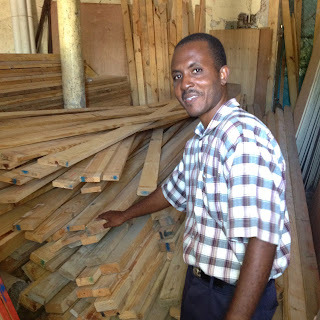 Father Maxis and lumber for the new school. 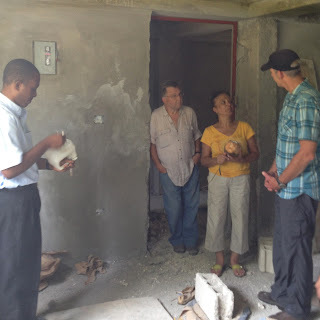 After we were given coconuts from which we drank fresh coconut juice, we toured the recently constructed school. It has a roof and walls for six classrooms and a room for teachers, but it did not have any finishes including windows. It's rooms are empty: no seats, desks, or black boards. And, it did not have any supplies to use to teach the anticipated 150 students who will attend. And, the latrines had not yet been constructed before the money ran out. Father Maxis had it wired with electrical outlets should electricity every reach the area (or someone donates solar). He also had the walls reinforced so that is earthquake safe, and so that a community center could one day be built on top of the school. Simply put, Father Maxis is a forward thinking, very bright individual who believes in the power of education to help raise the community out of poverty. It was indeed an honor to meet and to work with him. So after this assessment, we returned on the long and windy road to Port-au-Prince. The next day, it was decided that the best way to help Oranges school was to provide Father Maxis and the community with the needed school books and teaching materials for grades K-6. We worked with many kind Haitian businesses who sold us the educational materials at a discount since supplies were for the new primary school in Oranges de Bainet. We also purchased raw wood and building supplies for the community to use to build the desks, benches and chalk boards to fill up the now empty and unfinished classrooms. 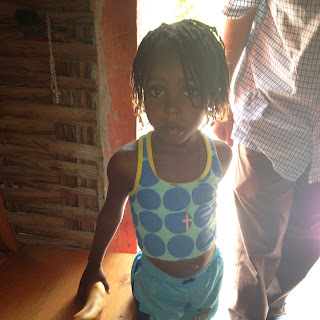 Haiti's future: A beautiful young girl in Oranges de Bainet. Father Maxis is still looking for donations so he can hire some full-time teachers for the school. Right now, he teaches the classes himself with help from some people in the community. However, he is looking for trained teachers to run the school. We estimated that with room, board and salary, $2,000 would be sufficient to pay for one teacher for one year. However, now that the school is finished enough to teach classes, and they have the books, Father Maxis is hopeful that he will be able to receive the funds to hire the teachers. Dr. Fiutak and I also met with community leaders in Port-Au-Prince who discussed issues of gender equality and climate change as well as the need for mediation training to assist them with conflict resolution in their communities, especially in some of the poorer parts of the city and outlying communities. We are looking forward to working with these folks in the future regarding these issues. Thank you for all who get out there and make it happen- in any way you can! This blog is really informative for students who learn online. Thanks for sharing information with us regarding Homework Assignment Help keep continue.